This page will give you a good idea of the approach taken in The Sentence Family. You will also be able to read some of the testimonials we have received. If you like what you see, you may purchase the book in the Bookstore, or through Currclick. Have you ever drawn a conjunction? Do you have fond memories of learning the difference between a noun and a preposition? This book introduces the thirteen members of the Sentence family (four adults and nine children), who are, of course, the four types of sentences and the nine basic parts of speech. The book presents basic grammar in a way that will give your children fond memories. The Sentence Family grammar curriculum was inspired by a fourth grade class many years ago and has proved to be an enjoyable and successful way to teach and learn the parts of speech. The personalities and pictures of the Sentence children symbolically show the nature, function and relationships of the parts of speech. The Sentence Family includes descriptions of each of the parts of speech - not in abstract terms, but in personalities of children. The interactions of the children, and their pictures, reflect the relationships of the parts of speech. The uniqueness of The Sentence Family lies in its use of art and the deliberate attempt to tap into the way children think and view the world. It is designed to utilize their love of drawing, their appreciation of "secret codes" and symbolism, and their great interest in relationships. 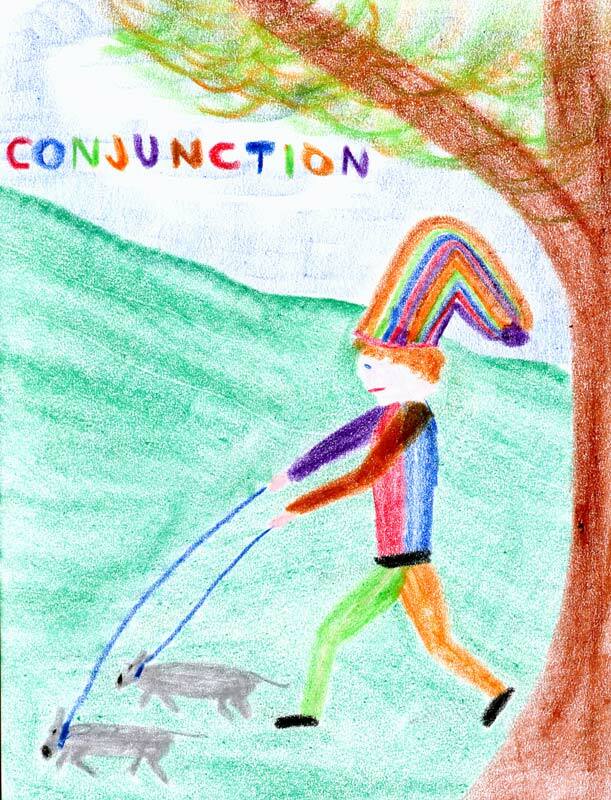 The Sentence Family emphasizes the relationships that exist among the parts of speech and uses pictures and diagraming to colorfully illustrate these relationships. Instructions for drawing and diagraming are provided. We have been using The Sentence Family at St. Michael’s Orthodox School for many years and have only recently been able to put it into a form for use by home-schoolers and classroom teachers. "Thank you for the very beautiful and effective materials. We are really enjoying The Sentence Family - both the 5th and 6th graders have used it and later this year the 2nd and 3rd graders will find out about this more slowly." "Thank you so much for developing The Sentence Family curriculum. I have been home schooling for seven years and it was the best educational experience I have ever had. My son, aged 10, was perfectly ripe for the content and dwelled long after the lesson on the imaginative stories presented, and asked lots of interesting questions which opened the door for a deeper understanding of the relationships among the parts of speech and diagraming sentences. I would have to say that your approach is the best I have seen, as it combines artistic creativity and imaginative story which is so perfect for children." "We found The Sentence Family to be wonderful, delightful and very joyable for both student and teacher. It is very “do-able”, even for someone who is not at all artistically inclined." "I have ordered most of the math items you offer, and we have enjoyed using them very much and I can not tell you enough how much my kids have enjoyed The Sentence Family. I can honestly say it is the best intro to grammar I have seen, I love it!" This more lengthy review was written by a home-schooling mother who writes a home-schooling blog in Maryland. The Sentence Family is a unique add-on to any homeschool grammar program. I read about it on a homeschool forum a few months ago and was intrigued because it purported to teach grammar through art. My twin daughters, age 11, are budding artists. Like a lot of other kids, they retain information better when they fully visualize what they are learning. Simple in scope, this small spiral-bound book turned into hours of productive fun for us all. The book lays out a story, where each character is a different type of sentence (i.e. Mr. Declarative) or a part of speech (Adjective and Noun are best friends). As you progress through the story with your kids, you draw each character with color and visual cues provided in the book. For example, Adjective and Noun wear the same color and Article is small and always drawn with Noun nearby. As you draw, you discuss the part of speech and note what each character might "say" in a sentence. It may sound silly, but it worked like a charm for my girls. As we spent about a half hour each day, reading the story and drawing, the name and function of each part of speech was cemented. We had covered this topic before with another curriculum but it never "stuck". At the end of the book, there is additional information on diagramming sentences. This section uses The Sentence Family in a way that is really pretty ingenious. If you are into diagramming, your kids will never forget "who sleeps where" in the big diagram bed drawn as you work through the story. I imagine kids from 3rd grade up to about 6th grade could use it. Some kids may find it too baby-ish, but if they give it a chance, I guarantee it will help them remember the function of each word. I recommend The Sentence Family for any child who likes to draw and is learning the parts of speech or diagramming. It's certainly fun, and for us, it was time well spent. You only need one copy for the entire family. We are loving this! My three children: 9, 7 and 5 are all learning and enjoying themselves. We are halfway through, and each week they beg me to "meet the new character". Even my youngest can identify the types of sentences. I highly recommend The Sentence Family as a fun, creative, engaging way to learn the types of sentences and parts of speech! "A parent brought the book to one of our teachers. We ordered it for all of our 3rd grade teachers. Did a teacher at your school write the book?" The Sentence Family is method of teaching children some basic concepts vof grammar, namely the four kinds of sentences, the nine parts of the speech and simple diagraming. The uniqueness of The Sentence Family lies in its use of art and the deliberate attempt to tap into the way children think and view the world. It is designed to utilize their love of drawing, their appreciation of "secret codes" and symbolism and their great interest in relationships. 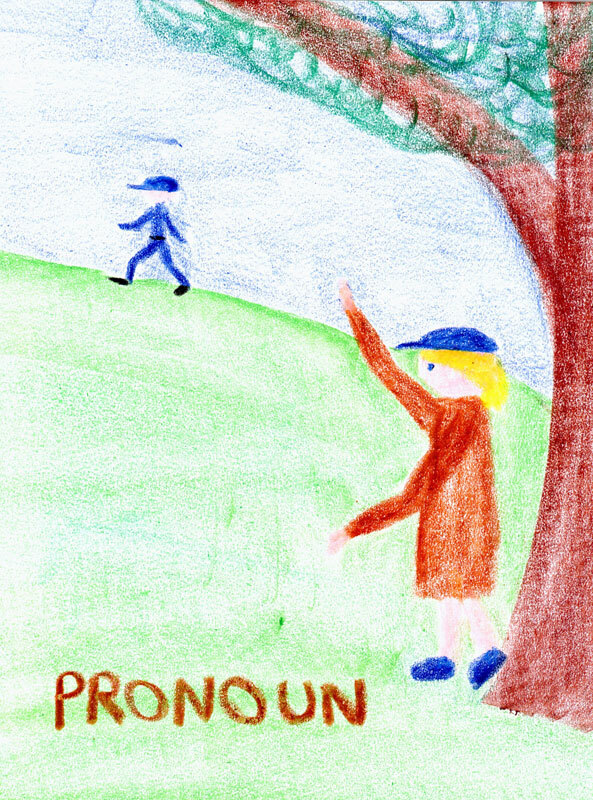 The Sentence Family emphasizes the relationships that exist among the parts of speech and uses pictures and diagraming to colorfully illustrate these relationships. This approach developed out of one of those embarrassing situations that perhaps all teachers have endured. The class for language arts that day was to be on the four kinds of sentences: declarative, interrogative, imperative and exclamatory. The plan was to tell the students a story about four unusual people I had encountered while walking down the street near the train station. Each of these people needed to know where the train station was located yet each of them expressed this desire in a different way. After the children were told about these kinds of sentences, we were going to practice identifying them by taking one sentence and express the thought it contained in four different ways. Just as I was finishing with the introduction of the four characters, I realized that the class, as originally planned, was not going to be as engaging as I had hoped. The lesson was still too abstract. Although the children liked the story, there was something missing and I did not know how to fill in the blank. About a year after Mr. Declarative and Mrs. Exclamatory Sentence were married, they were blessed with twin boys. Although Mr. Declarative spoke in a rather matter-of-fact manner about his sons, his eyes showed that he was a very proud and happy father. Mrs. Exclamatory, of course, exclaimed her delight with every word she spoke. They named the boys Verb and Noun. Yes, these are rather odd names for children but we must remember that many things about the Sentence family are a bit strange. One might think that, being twins, the brothers would be very much alike, but this was not the case. As the boys grew older, it became clear that their personalities were very different. Verb is a very active child. He likes to walk, run, climb, dance, ride, write, talk, sing, jump, whistle and do anything else you can imagine. He rests sometimes, but is most often doing something exciting. You will always see Verb dressed in red. In fact, all of his clothes are red. His shirts are red; his pants are red; his gloves are red; his socks are red. Verb also has a collection of red hats, but you will seldom see him wearing his hat. He is so active his hat nearly always falls off. Everything that Verb wears is red, except for one thing. His shoes are black. If you ask him why he doesn't wear red shoes, he will tell you that, although he likes red shoes, he wears black shoes to be like his father. 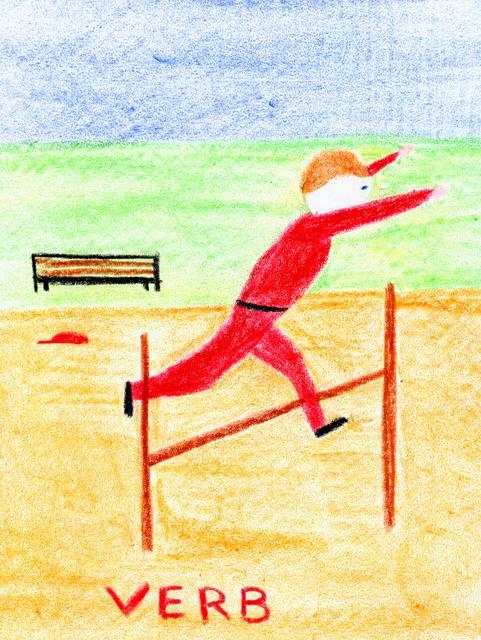 The picture of Verb must show him doing something very active. He could be climbing a tree, jumping over a hurtle, or throwing a ball. The particular action is not important as long as it is obvious. His shirt, pants and socks are red. His shoes are black. His hat can be either on the ground or missing altogether. Beneath the picture there should be room for a few lines on which the child can write examples of the things Verb would do. Here the children write simple verbs, not whole sentences. This same format is used with the picture of each Sentence child. Our main objective at this point is to convey the main idea of a verb, a word which expresses action, or state of being. We can teach the more abstract verbs later. Adjective’s twin sister is named Adverb. Like her sister, Adverb is a very good artist. She is very fond of her brother, Verb, and likes to paint pictures of what he is doing. Because Adverb's favorite color is orange, she always wears an orange dress. Her hair is also yellow, and she always wears red shoes. If you were to ask her if she wears red shoes for the same reason her sister, Adjective, wears blue shoes, she would say, "Most certainly." Adverb is actually a more accomplished artist than her sister, Adjective. When she is painting her brother, Verb, she always uses a canvas with a red frame. Some of her paintings, however, have a green frame or an orange frame. Adverb has studied how to make different colors for a long time and can paint not only Verb, but also Adjective and even herself. This is why her picture shows two extra canvases. She uses a green-framed canvas when she is painting Adjective and an orange-framed canvas when she is painting herself. The picture of Adverb shows her in profile sitting in a chair. She is painting Verb just as Adjective was painting Noun. Adverb is shown left-handed, but you could easily place her on the opposite side of the canvas, making her right-handed. Additional features, such as small tables with painting jars, are up to your discretion. 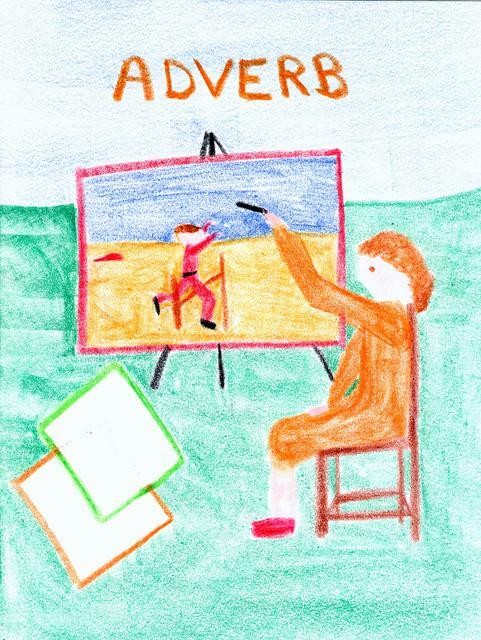 As with the other drawings, leave room at the bottom for examples of words that Adverb would use. Once again review all the sentences used previously to see if Adverb says anything in them. At this point the children often want to underline all the words. If they underline an article, a preposition, a conjunction, a pronoun, or an interjection, thinking that one of the first four children said it, simply tell them that there are still more children to be introduced. 1) The tiny mouse ran quickly across the wooden floor. 3) The small boy called loudly to his mother. 4) Please close the door quietly and slowly. 5) The red and yellow kite flew high in the gentle breeze. 6) A large lion silently stalked the very* small deer in the dark forest. 7) I nearly choked on a piece of delicious pie because I ate too** quickly. 8) Yesterday I saw four very* large trucks. 9) The trucks traveled very** rapidly. 10) My sister eats slowly and speaks softly. * This is Adverb describing or "painting" Adjective (small, large). ** This is Adverb "painting" herself (quickly, rapidly).